Rory McIlroy was close to tears in confirming the end of his relationship with Danish-born tennis star, Caroline Wozniacki. The 25-year-old double Major winner looked very subdued and uncomfortable throughout the near seven minute news conference within the Media Centre at this week’s BMW PGA Championship at Wentworth. Bizarrely, McIlroy had been asked last fortnight what was his relationship with Wentworth and he had just one word to describe his efforts on the West Course and that was ‘strained’. And that’s just how he looked this morning. McIlroy had earlier issued a statement confirming his split from Wozniacki, and just days after reportedly sending out invitations to the couple’s wedding. “It is quite a difficult time for Caroline and myself, and I think the statement really said it all this morning,” he said. The announcement comes as a huge shock given McIlroy had spoken last fortnight at his delight in meeting up with Wozniacki in London after competing in the Players Championship. Wozniacki had been due to compete in an event in Rome but withdrew to meet up with him. The pair then attended a London play ‘Bodyguard’ on May 13th and the Tuesday after McIlroy arrived in London from participating at TPC Sawgrass in Florida where he secured his eighth top-10 in 10 events this year. As well, Wozniacki had spoken just recently of her joy in becoming a ‘young’ mother. McIlroy had proposed to Wozniacki on New Year’s Eve in Australia while on a Sydney Harbour cruise, and after first seeking her parent’s permission. The pair first met on July 2nd, 2011 at the David Hayes-Wladimir Klitschko World Heavyweight boxing match in Hamburg. McIlroy was sitting right behind Wozniacki at the bout, and the two started chatting and struck a friendship. “Look, I think I’m no different than anyone else,” he said. “Everyone has been through break ups and it’s obviously very, very difficult. McIlroy is among four of the world’s top-10 contesting this week’s European Tour flagship €4.75m BMW PGA Championship, and an event where he confessed at last fortnight’s Players Championship that leaves him ‘strained’ given his best finish in six appearances was fifth in 2009. 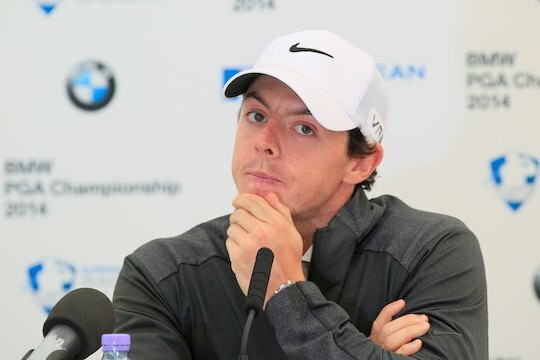 And given his obvious discomfort in ending his relationship with Wozniacki, McIlroy was asked if he felt he could concentrate on his golf this week, and if he considered withdrawing from the event. “I’m not going to lie. It’s going to be very difficult,” he said. “But you know, at least when I get inside the ropes, just try and concentrate on the shot at hand. But yeah, it’s obviously going to be difficult.